Craig Morgan Teicher is an American poet and literary critic whose first collection of essays—We Begin in Gladness—was published in November. Earlier this year he wrote an essay in The New York Times about what he’s learned by reading aloud with his son Cal. Cal, 11, has cerebral palsy and doesn’t speak. We talked about communicating beyond, or outside, language. BLOOM: What are Cal’s favourite things? Craig Morgan Teicher: Music is definitely one of them, but more than anything, he is happiest when spending time with other people. I feel his life is animated by his proximity to people. He’s very in love with his younger sister, and he lights up whenever she’s anywhere near him. He loves going to school and being part of the chaos that is his classroom. We do a lot of music at home. I love jazz and instrumental music and we have that on all the time, and we make up silly songs on the guitar and make a racket. BLOOM: How does he communicate? Craig Morgan Teicher: Smiling is his most basic way of saying 'yes,' and his 'no' is pretty clear. It’s challenging when I try to explain what it’s like to communicate with him. The people who spend a lot of time with him can see a lot of the shades of his feelings. One of the big challenges of my life—or not challenges, but wishes—is to really understand him. I feel like I’m missing so much of what he’s actually trying to tell me. And yet I also feel like I get so much of it. BLOOM: Could he use a communication device? Craig Morgan Teicher: He’s tried everything. It’s the usual problem with severe cerebral palsy that he can’t quite get his hands, his head or his foot to activate a switch. We haven’t had much success with most of what’s out there. He uses an eye gaze system with mixed results at school. BLOOM: With my son I always found the technology was cumbersome and not nearly as intuitive and automatic as mainstream business technology. I used to liken it to my son having to go to a dictionary every time he wanted to say something, and look up the word. After a while, you give up. Craig Morgan Teicher: Or it’s like a dictionary with only eight words—you have to make your life work with eight words. 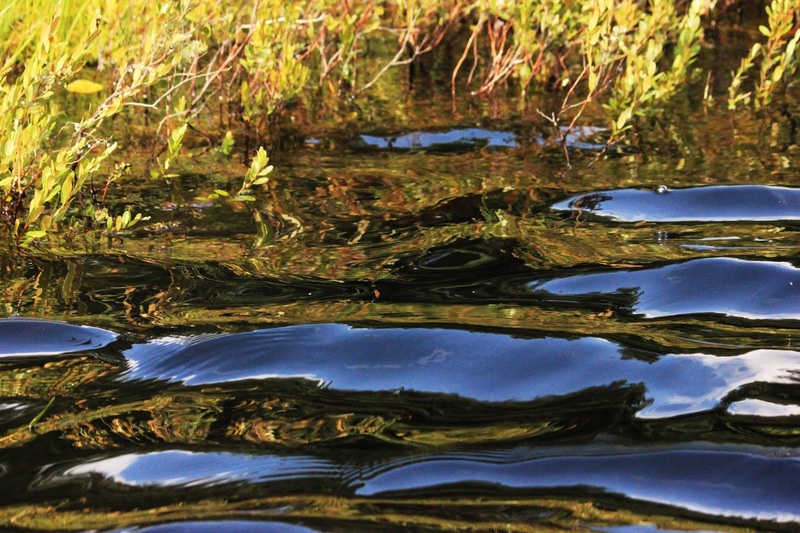 One of the big lessons for me with my son is the same lesson that poetry teaches—that language is fluid, and constantly changes, as words are loaded and unloaded with meaning: that meaning is pretty fluid. So I look at my son’s way of communicating as fluid. It’s not just a yes or no, I want to do this or that. It’s a continuum of trying to express pleasure and displeasure and excitement and beckoning and pushing away. The struggle is to get further away from yes or no and get to all of the things that really make up a life. For me, as a word person, one of the things that’s so startling about raising Cal is that it’s intensely physical in a way that no other relationship I have had, or imagined, is. I have to act as an extension of his body and his wishes, and sometimes I have to work against his wishes. That’s really hard to describe, and there aren't words for it in our language. BLOOM: When I read your piece in The New York Times, about reading aloud to Cal, and wondering what he’s thinking, it made me think of an interview I did with British theatre director Stephen Unwin, who has a son who doesn’t speak. Stephen said: ‘I was brought up with language. I had a really old-fashioned English classical education. I’m over-educated, language is everything for me and I’m dealing with a son who has no speech. I love the boy to pieces and I’m grief stricken and that’s not a contradiction, that’s real.’ As a poet, what have you learned from a son who can't engage in formal conversation? Craig Morgan Teicher: Before Cal was born, and into the beginning of his life, I thought that language was really the way that life happens, and now I see there are many ways. I’m not unhappy that there is a part of my life that exists outside of language. Music is definitely a way that Cal and I transact happiness and feeling. I’m not a good musician, but I’m a self-taught guitar player, and from the beginning of Cal’s life we’ve made up silly songs together—sometimes with words and sometimes not. That’s a pretty great way of communicating with someone. It’s not precise in the same way that words are. I think maybe I have enough language in my life that I don’t specifically grieve Cal not having it. I deeply grieve that he doesn’t have a choice to use or not to use words. That’s really painful. BLOOM: I read your profile of Jesse Ball, the author of the novel Census, which includes a character who has Down syndrome, but as readers we’re not told his diagnosis. And you quote Ball saying something about how it’s impossible to write a true portrait of a person using our culture’s language for disability. Do you find that words impede our understanding of what disability is like? Craig Morgan Teicher: Definitely. Sometimes Cal and I will lay on the floor next to each other and stare at each other, or make funny noises. There’s a lot of holding hands that you don’t normally do with an 11-year-old, but that stands in for what we might do with words. One of the things I’ve learned, especially watching my daughter introduce her friends to her brother, is that a lot of people go through their whole life without ever meeting a person with a serious disability. As a culture, we're a lot more comfortable with less and less precise language to describe the lives of people living with disabilities. That makes me sad and angry—except, of course, I was the same way in that I didn’t know someone with a disability until I became a father. BLOOM: Something I learned from my son was how important presence is. In our culture, people don’t appreciate the value of presence and being. It’s all about what you can do, and if you can’t do something, you’re stripped of value. Craig Morgan Teicher: If Cal hears someone he cares about walk into a room, he knows, and it’s not because he’s looking at them. He can feel the room in a way that I certainly have not learned to pay attention to. To him, presence is a huge part of what his life is, and he’s made it a huge part of what my life is. As a person who spent my childhood and youth in my head a lot, living with my son has taught me a lot about the power of just being in the presence of someone else. BLOOM: How do people around Cal respond to his lack of speech? Craig Morgan Teicher: He’s a very happy person, a very joyful person, and the people who know him well are generally happy when they’re around him. He gets all the staring and weird confusion from other kids that many disabled kids get. Many grown-ups are afraid, and think they don’t know what to do. The most shocking thing for me has been watching my daughter become aware of the extent to which people stare at us, and how she feels about that. BLOOM: I remember when my son was young that I read a lot about how you can prepare for difficult social situations by role-playing responses. For a long time I felt that was my job. But now it really depends on whether I’m in the mood. Sometimes I’m in the mood to educate, and sometimes I’m not. Craig Morgan Teicher: Sometimes I don’t rise to the occasion at all, and I want to make sure my daughter has that right. BLOOM: Has Cal’s lack of speech influenced the way you write or read poetry? Craig Morgan Teicher: It definitely has. But poetry has as much informed the way I think about Cal as Cal has informed the way I think about poetry. Something that’s very true about poetry is that a lot of what it is about is the silence that surrounds it. It’s the stuff that’s not in it, but that is to do with it. The thing we’re not saying that the poem implies, that the poem whispers. Silence is a big part of the world around Cal, and what you learn about silence is that it’s not so quiet and there’s all this stuff moving around in it. That insight is equally true of poetry and of people, and especially of people who don’t use words. Language isn’t the only way of communicating. BLOOM: In your piece about reading to Cal, you note that he responds with sounds, but you can’t know for sure what meaning he’s taking away. By the end, you seem satisfied that his meaning could be a number of things. It could represent his love of your voice, or his understanding of the emotion it conveys. Or it could be his own unique way of visualizing a character when, as you note, he isn’t able to see colours the way you can. Our culture values speech as a way of demonstrating intellect. But is the meaning that a child who can’t speak, or who may think differently, takes from listening to a book as valuable as the meaning a typical child might be tested on at school? Craig Morgan Teicher: I don’t think the meaning a typical child might be tested on at school is particularly interesting. As a writer, the last thing I want is for someone to think about writing as a puzzle that you have to solve to get to the right answer. I think of writing as much more like being in the room with Cal, a reader's presence next to the text, as opposed to anything that resembles testable understanding. What was fun about writing that essay was that reading to Cal had become a way of experiencing his presence and my presence next to a book. Reading aloud was a way for me to hear the book myself, which was something that I wasn’t good at doing before. I had trouble imagining it in my head. I guess I’ve come to believe, though I can’t verify at all what Cal is getting, that the way he’s interacting is the ideal way. It’s to be present with a book. Certainly my own relationship with books is much more about them as good company, and as people in the room, than about getting the meaning right. Part of what I do is interpret books in writing. I’m a book critic, but that aspect of what I do is a pretty limited way of thinking about what a relationship to reading can be. BLOOM: What’s been the greatest joy of raising Cal? Craig Morgan Teicher: There isn’t any one thing. It’s just him. I’ve been surprised, especially as I’ve written about him more, that I can describe my family as a happy one, and that a lot of families I know that include a child with special needs are happy. BLOOM: Have you written about disability in your poetry? Craig Morgan Teicher: It certainly comes up a lot. Cal comes up a lot. I don’t think it’s my place to write specifically about disability. I’m not disabled and I don’t want to speak for others who are. There is a very strong community of poets with disabilities who write all kinds of poems. Beauty is a Verb is one excellent anthology to start with. BLOOM: What do you hope people take away from your writing about Cal? Craig Morgan Teicher: As I’m writing more about Cal I’m trying to figure out who I’m writing to. I don’t want to make someone feel that my way is the way they should do it. I want to supply some language around which people could think about this kind of a parenting journey. Lisa Drumonde is a registered practical nurse working with children who are hospitalized at Holland Bloorview for rehab after painful bone surgeries or life-changing trauma. She recently won the DAISY award, which recognizes a nurse that uses a strengths-based approach and combines top-notch clinical skills with deep connections with children and families. Lisa Drumonde began work almost 22 years ago at what was then the Bloorview Children’s Hospital. 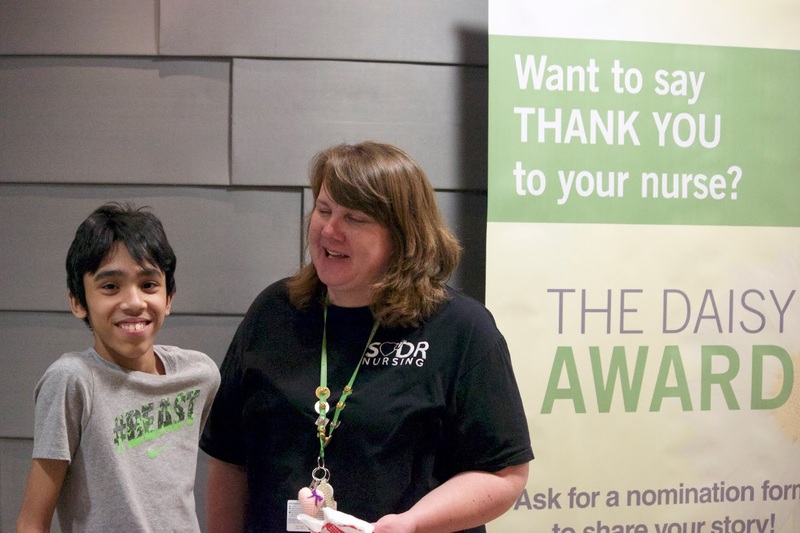 Hammas, 14, pictured above with Lisa, describes her as a nursing "legend." Lisa Drumonde: When I was about 10, my family was ready to go on a trip to Disney when my younger brother didn’t feel well. My mom took him to Emergency, and they discovered a tumour on his lung. That was my first experience around nurses, and it stayed with me. I think being a sibling in that situation gave me empathy toward the siblings of the kids we work with. After high school I went off to York University to study history. While I was there I got a job at a hospital as a weekend housekeeper. There were a number of students working there. I had a lot of interaction with the patients—who were adults. I really enjoyed being with the patients, and seeing some of the things the nurses did on the unit. I decided to change direction and go into nursing at George Brown. BLOOM: What made you think nursing would be a good fit for you? Lisa Drumonde: I’m a pretty easy-going person, and I’m patient and kind. BLOOM: How did you decide to work with kids? Lisa Drumonde: Everything led to kids. It was almost my fate. I initially got a job working as a pediatric home nurse at night and on the weekend. Then I was taking a certificate in rehab nursing and I did a placement with Kelly Brewer, the physiotherapist, at what was then the Bloorview Children’s Hospital. I saw they were hiring, and having the pediatric experience enabled me to get the job. BLOOM: You usually work evenings. Do you like that shift? Lisa Drumonde: I love it! I can get my kids up and out in the morning and make sure everyone’s got their lunches and eaten breakfast. I have two girls—a 12-year-old and a 15-year-old. My older daughter has a chronic illness, and the evening shift gives me the flexibility to accommodate the needs of my family. Coming to work in the afternoon helps me shift gears and be that other person—not just a mom. I get a lot of gratification from the kids and families I work with, and from being around my peers. BLOOM: How many children do you work with on the evening shift? Lisa Drumonde: Usually it’s three. I’ll go into the computer and check on their care and what they’ll require, including their medications. We have the evening routine, which is dinner. Some of our kids are at a stage where they need to be walking to meals. I may do range-of-motion exercises with my kids, or showers, or wound care. Managing pain is a big thing. Something may happen and I need to call the doctor or pharmacy or orthotics. It’s really beneficial when you have the same kids for a few shifts in a row. You get into a really nice rhythm with them. You know exactly what they need, and what motivates them. Consistency is important to families as well. BLOOM: What’s the greatest joy? Lisa Drumonde: Interacting with the kids. Having a laugh: making them laugh or they make me laugh. It’s the relationship that you build with the kids and families, and the trust. I had one child last week when she first came in, and then I didn’t have her for a week. When I got her again, she’s so much stronger, and able to move from her bed better. Seeing that progression in kids is really rewarding. I love the nurses that I work with, and I enjoy working with the other disciplines too. I take my job seriously, but I like to have fun with it. BLOOM: That’s the creative part. Lisa Drumonde: Yes. And I like the teamwork. I feel we’re very strong on the specialized orthopedic and developmental rehab unit (SODR) in regards to having each other’s back, and working together. BLOOM: What’s the greatest challenge? Lisa Drumonde: When families are here because their child has been through a traumatic experience. Families are very stressed and trying to cope with what’s happened. Helping to support the family through that is probably the hardest thing, because I want to say and do the right thing to help them. BLOOM: How do you manage that? Lisa Drumonde: I feel nurses do a good job of supporting each other. I know my manager is always available to support me, too. Lisa Drumonde: Mostly joy. I feel very grateful to be working here and to be working with the kids. The parents trust us to take good care of their kids, to get the right meds, and to do the right things to help both child and family. Sometimes there’s sadness. I really feel for some of the families. I have to put up a bit of an emotional wall sometimes, or it can affect you too much. BLOOM: I remember in our narrative nursing group, which you were in, a number of nurses spoke about times they felt helpless. Lisa Drumonde: Yes, when children have nerve pain it’s brutal. The medications that can help it usually take a couple of weeks to be fully effective. It’s hard to see a child in so much pain, and even strong analgesics don’t help. BLOOM: How do you cope with that? Lisa Drumonde: I talk to my nursing colleagues. I get their advice and their opinions. They may have good suggestions, not only to support me, but in how to help the child. The biggest thing for me is talking to others who understand. BLOOM: I’ve always felt that nurses, because they spend so much time with our families, have the opportunity to develop close relationships that can give them unique insights. Lisa Drumonde: With me, being here as long as I have been, I’ve noticed in the last year or two a certain confidence within myself. When I go into a patient room now I feel very comfortable and confident. The families sense this, which is a positive way to start my relationship with them. BLOOM: What qualities are most important in a nurse? Lisa Drumonde: Patience, kindness and understanding. Being flexible, but also having the right amount of firmness, too. Time management is important. You need to be innovative and knowledgeable. BLOOM: How do you innovate? Lisa Drumonde: We’re seeing more and more kids on the unit who have anxiety. So finding a way where you can help the child to trust you and be comfortable with you. If you need to do a dressing change, finding a way where you can lower their anxiety. It may be doing something silly, or funny or singing. Sometimes iPads are a helpful distraction. Lisa Drumonde: One thing we talk about on the unit a lot is having more psychological support for our kids who have gone through sudden, traumatic experiences. For example, we see a lot of kids who were involved in a motor vehicle accident, or who have a spinal-cord injury. BLOOM: What did you think when you heard you’d won the Daisy award? Lisa Drumonde: I was overwhelmed. I had no idea I’d won it. It all happened on the unit. Julia was there and other upper management people, and the kids and families and the staff. I was given a statue that was carved in Africa. It’s really special. Receiving the Daisy award was a truly meaningful and touching moment in my nursing career. Eunice Kang’s music career began at the age of three. Her mother was a professional pianist, so “there was no choice for me not to go into the music field,” she says, laughing. Eunice has a university degree in violin performance from South Korea, and spent her 20s travelling the world as a professional violinist. Eunice came to Canada to study music therapy at Wilfrid Laurier University and volunteered at Holland Bloorview while she was a student. She later did an internship here and was hired in 2011. Eunice is a registered psychotherapist, neurology music therapy fellow, and accredited music therapist. She brings a unique perspective to the families she works with because her son Nathan developed seizures at age two. Eunice Kang: Through my whole life I’ve played the piano and the violin. After performing in numerous concerts during my 20s, I wondered if there was another field I could dedicate myself to, where I would feel more valuable. I love working with children and that’s when I thought about music therapy. Eunice Kang: During the week I mostly see inpatients where the goal is to help them regain their abilities, or enhance their existing ability. Music is a safe environment. Most children like music, so it can have a life-changing impact on them. We have many traditional instruments and new music technologies like Soundbeam, which uses sensors to detect movement and translate it into sounds, and the virtual music instrument. Through music therapy we help children to improve physical and mental health or to better cope emotionally with their hospitalization and loss of abilities. BLOOM: How would you support their emotional wellbeing? Eunice Kang: Often it’s by making our own music. We may use technologies like GarageBand and they’ll write their own song, or we may pick famous music and change the words to reflect their emotions and stories. BLOOM: What about your work with outpatients? Eunice Kang: We see a lot of children with autism who are outpatients. They may be working on improving communication or self-regulation skills. 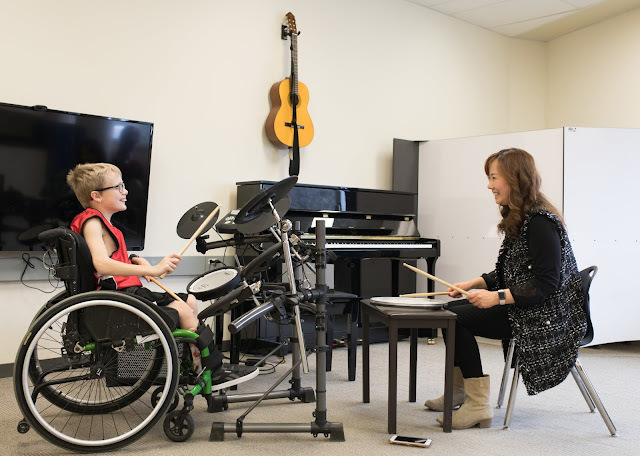 They may be learning how to play the piano, violin, guitar, ukulele, drums or shakers with individualized education plans. BLOOM: Why is music important to children with disabilities? Eunice Kang: It offers a safe, rewarding place where children can be themselves. In music therapy, you don’t need any prerequisite skills. As music is non-verbal, we can communicate and express ourselves more easily through it. That motivates our children to enhance their skills. BLOOM: What are the joys of your job? Eunice Kang: I especially love to work with babies and young children. I also love working with teenagers and preteens. But the babies are pure angels. When we’re doing therapy, I don’t feel like I’m doing therapy. I’m enjoying them, moment to moment, and I can feel joy. When clients make progress—it doesn’t matter if it’s slow or fast—it boosts my self-confidence. I remember one family who came and during their child’s assessment, the mother started to cry. I asked her why she was crying, and she said she’d never heard her son say his name. He said it many times in that session. So there are breakthroughs. Eunice Kang: Sometimes controlling my emotions. My son’s seizures started at age two. Sometimes I see people going through what we went through and hard moments for our parents bring up my own memories and emotions. BLOOM: Can you tell us a little bit about your son Nathan? Eunice Kang: He was hospitalized for three months due to a high fever and then the seizures started. They are intractable. He lost the ability to stand, walk and talk. It’s a disaster to see your own child lose everything. My son is eight now, and I’m better. Time heals me, too. BLOOM: Was there anything you found helped you cope with your son’s medical condition that might be useful to other parents? Eunice Kang: The best thing is direct family support. Emotional support is important, and Andrea Lamont here has done lots of therapy with me. I’d say the reason I survived was because of Andrea’s support. When something like this happens, it’s best to open up to someone you trust and talk about it, rather than hide. Some of the parents here who know my situation have also been very helpful in my life. When I started, I didn’t think I would have a special-needs child. Now that I do, I have lots of support from my managers and coordinators. Everyone understands my situation, and they make everything easy for me to work. The Canadian health-care system is so much better than in Korea, so I feel really blessed that Nathan was born here. BLOOM: How has your own experience parenting a child with disabilities influenced your work? Eunice Kang: My attitude has changed. When I was a beginning music therapist I didn’t really take work home with me. But now I take things more seriously. Now there’s no boundary between work and home, but more of a continuation. I also find that I think about the child and his or her environment more inclusively. I’m not just thinking about music therapy. I will check to make sure families have all of the available resources in other areas of their life. BLOOM: What have you learned through patients? Eunice Kang: I really admire their courage and how brave they are. I’m often surprised at how families will advocate and protest to protect their child. They’re very involved in their child’s care. BLOOM: What work here are you most proud of? Eunice Kang: The Baby and Me program, because I love helping parents and baby to bond together, and to help with parent’s emotional challenges. I also love Holland Bloorview Rocks. The children attend about 10 or 11 practices and then we put on a concert. I will never forget the joy and excitement on their faces, and their attitudes when they’re on stage. They are pure rock stars. This program also supports our music therapy program, so the children are proud to know that they’re helping other children.